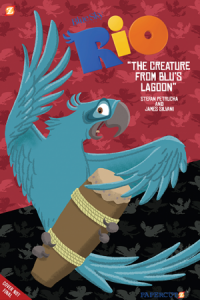 It might seem like an age ago, but earlier this year the animated sensation of the moment was Rio 2. Now that we’ve moved on to the summer, Paperkutz have announced a new tie-in graphic novel, carrying on after the events of that film. “While recording bird calls, Linda loses her new digital recorder, but when Blu finds it, it’s full of strange and horrifying growls! Is some sort of new predator on the loose in the sanctuary? Before the gang can solve the mystery themselves, monster-hunters and reality shows invade, turning their quiet jungle home into pandemonium. ” Rio 2: The Creature from Blu’s Lagoon is written by Arie Kaplan and illustrated by James Silvani. The full-color trade paperback is available for pre-ordering; otherwise look for it in stores this fall.